People, man: always stickin' things into dang BOXES all the time. San Francisco's Mourad Lahlou on crafting a cuisine that reflects his up-to-date Moroccan roots—dug deep in California soil. 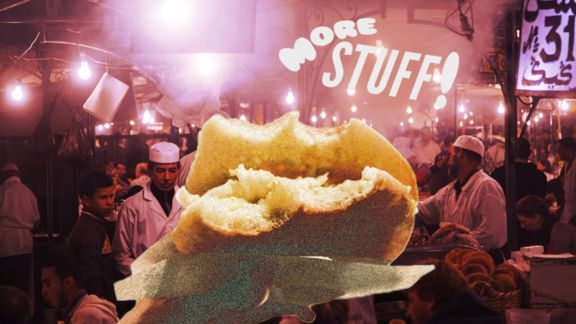 If I were to eat a sandwich in the middle of the Marrakech market at 10:00 at night—with the smoke going off everywhere, the lights, the sounds, the temperature, the climate, everything is there—it's perfect. If you take that same sandwich and you bring it to the Ferry Building and you take a bite out of it, it’s ordinary. If I were to keep making the same food that I thought I should be making, because that’s what people expected, my food would taste like that sandwich. Eaten outside of its context. Food has to have a sense of place. I think what we’re doing here is challenging. It’s telling people, yes, I have connections to Morocco, I have a foundation in Moroccan food and Moroccan cuisine, but I’ve also lived here for a long time. This is my perspective on food given my background, and given my life here. I think that’s more honest than anybody could ask for. If I wanted to fit in—concept-wise, food-wise—I would have just given people exactly what they expected, and nobody would ever be challenged. If I do something like this, and I can influence one person to take it to the next level, I’ve done my job.